Cancellation can be made 14 days before arrival. In a case of no show, the total amount of the reservation price will be charged. The reservation for the Group is on demand. Please contact us on apartmentsriver@gmail.com or +38761205522 to confirm the reservation. Deposit of the 40% of the reservation is required. The deposit must be paid on bank account that will be given in further correspondence, by Paypal, or by Credit Card. Above the banks of the river Miljacka, perfectly located in a historic place of Bentbaša - Sarajevo Old Town, newly adapted rooms and apartments in Guest House 'Pension River' offer chic and modern accommodation just 300 meters away from the Sarajevo City Hall - Viječnica, and famous Baščaršija Fountain. Olympic mountain Jahorina is 25 km away. With stylish décor and comfortable large beds, each room has its own private bathroom, free Wi-Fi and flat-screen TV with satellite channels for guests to relax with. 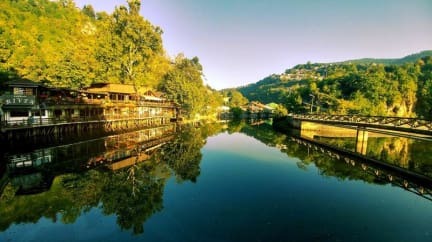 In most of the rooms, guests will have an opportunity to enjoy drinking coffee on their own spacious terrace above the river, with breathtaking view of the lake, river, hills and Sarajevo Old Town. Basic - Economy (budget) rooms without terraces are also available, and guests will still have an access to the common terrace across their room, where they can enjoy too. Free private parking is provided in front of the property. Good breakfast is also included in the price, and it is served at our traditional restaurant 'Bazeni' where Oscar winning actress, beautiful Penelope Cruz, was filming “Twice Born”, Sergio Castellitto’s movie.